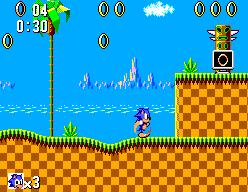 Green Hill Zone is the first zone in Sonic the Hedgehog for Sega Game Gear and Sega Master System. It is loosely based on Green Hill Zone from the Sega Mega Drive version of the game. The zone, again like its Mega Drive counterpart, is filled with rolling plains of green and jauntily colored flowers. It's not all natural goodness, though, as Robotnik has installed spike pits and set his ubiquitous robotic minions loose on the verdant landscape. Geographically speaking, the Zone is located on South Island. Sonic made a brief return to Green Hill Zone, destroying Dr. Robotnik's eggpod (and Robotnik as well) saving South Island in the process. The differences between the Mega Drive version and the Game Gear/Master System version are fairly obvious. Less dynamic colors, with limitations caused by the hardware of the SMS/GG. The blue background of the MD game is now somewhat paler, and the plants in the background do not animate quite the same. With regard to non-technical differences, underground tunnels containing water appear in Act 2, which are unlike anything in the Genesis version of this zone. These pools would return in Sonic Mania's version of the zone. Moto Bug - Insect robots that scoot along the ground. The zone's background music is based on the 16-bit counterpart. The composition is not identical; Some notes have been altered to better suit the hardware capabilities. Less audio channels are used (again due to hardware restrictions) resulting in a tune with much less depth than the original, but still easily recognisable. This is the introductory level to the Sonic game. The first enemy is a Motobug on the ground, which you can either jump on or over, followed by a Crabmeat. To reach the end of the level, you must simply run from the left of the level to the right, avoiding obstacles, enemies, and spike-filled pits (which can be passed by jumping on small floating blocks in the air). You begin on the top left of the level, and as you walk to the right, Sonic trips and falls through the ground. You end up in a cave near a Crabmeat. Navigate to the cave floor, move through to the water pools at the bottom of the level, and climb up ledges to get to the top of the "mountain". As you climb back up the cave (after having bounced back out of the cave using a spring), you will need to enter a cave on the left (so as to reach the top of the level). Instead of using the spring to reach the top, jump over the spring, fall down the water fall, and fall down the next one. On a ledge is the Chaos Emerald. Run and avoid the pits. When you get to the top, Robotnik will fly around higher than can you reach for a bit and descend. This is when you hit him. Get out of the way — he will zoom off screen, then repeat the process. Hit him eight times to get rid of him. This page was last edited on 8 April 2018, at 10:11.